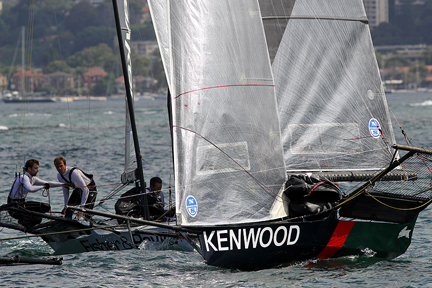 The Asko Appliances team of Marcus Ashley-Jones, Jeronimo Harrison and Ash Rooklyn had to overcome a desperate battle with the Lumix team before taking out Race 1 of the Australian 18ft Skiff Championship on Sydney Harbour today. With no more than 15s separating the two teams for more than half the course, the two teams headed for home with only 2s between them. 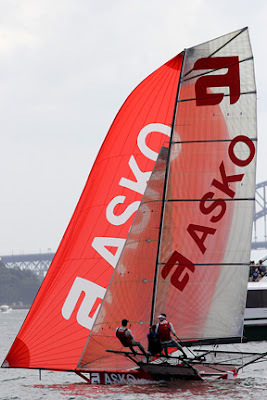 Lumix (Jonathan Whitty, James Hozack and Aron Everett) tried desperately to force an error by putting in several tacks, but the Asko crew was up to the challenge and finally crossed the line as a 38s. winner. Thurlow Fisher Lawyers, skippered by Hugh Stodart, who replaced an injured Michael Coxon, with Trent Barnabas and Dave O’Connor, finished a further 52 seconds back in third place. Mojo Wine (Chris Nicholson) was fourth, followed by Smeg (Dan Phillips), and the defending champion Seve Jarvin sixth in Gotta Love It 7. Ironically, it was Jarvin’s 2012-2013 Australian champion skiff (now sailing as Asko) which won today’s race. Once again this season, the fleet was faced with less than ideal conditions; light wind which shifted continually throughout the entire course. From the start the fleet split into three separate groups and those electing to stay in the middle or go to the right hand side were best served. 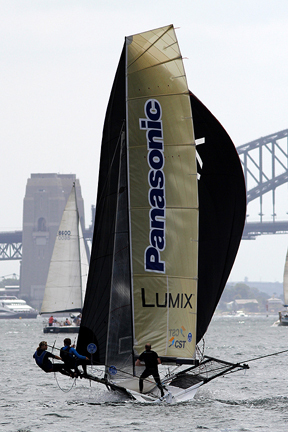 Lumix was always near the lead in the middle group and held a 30s lead at the windward mark in Rose Bay. 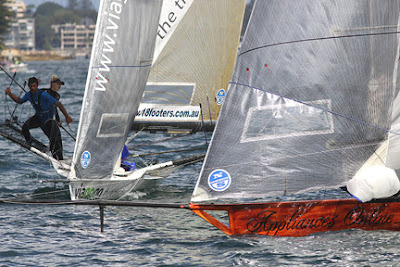 Smeg was in second place, ahead of Asko, Appliancesonline (Micah Lane), Thurlow Fisher Lawyers and Ilve (Ollie Hartas). 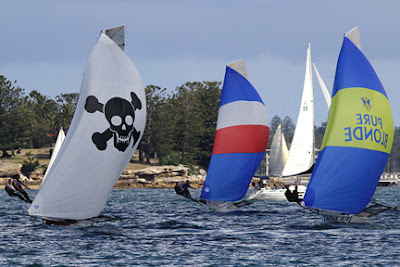 Lumix extended her lead to more than 40s after the long spinnaker run from Rose Bay to Robertson Point, but Asko was already starting to make her move as she went ahead of Smeg. The gap between Lumix and Asko was down to just 12s at the following windward mark off Clarke Island and that’s where the battle began. 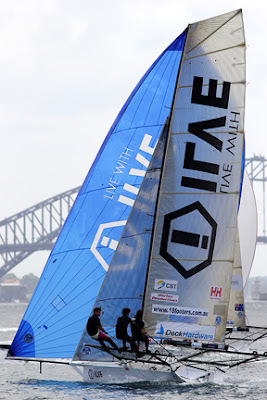 Smeg was still third but the shifting breeze saw positions change dramatically throughout the fleet. 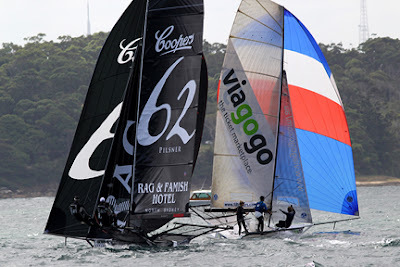 Sydney City Marine (Dave Witt) had recovered from a distant position early to be fourth ahead of Mojo Wine, Thurlow Fisher Lawyers, Gotta Love It 7, Appliancesonline, Coopers 62-Rag & Famish Hotel (Jack Macartney) and Viagogo (Alexandra South). 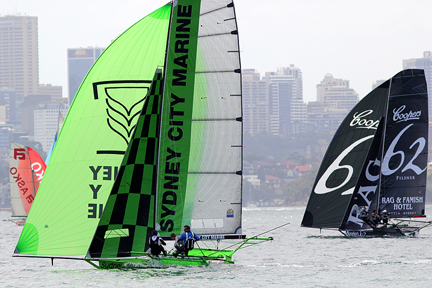 The leading four positions remained unchanged on the two-sail reach to Chowder Bay, but Asko finally grabbed an 11s lead from Lumix at Rose Bay. On the ‘sausage’ leg across the harbour to Taylor Bay and return, the two leaders maintained their battle with just a few secs. separatin them at all times. The Thurlow Fisher Lawyers team were now starting to come to the fore and began to establish itself in a clear third place. 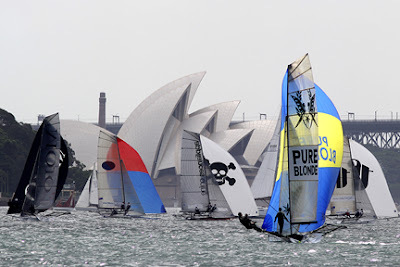 While the conditions were less than perfect, the racing was close and the uncertainty of the wind made sure spectator interest was retained right to the end. The result has also thrown the championship wide open and next week’s race will be critical.